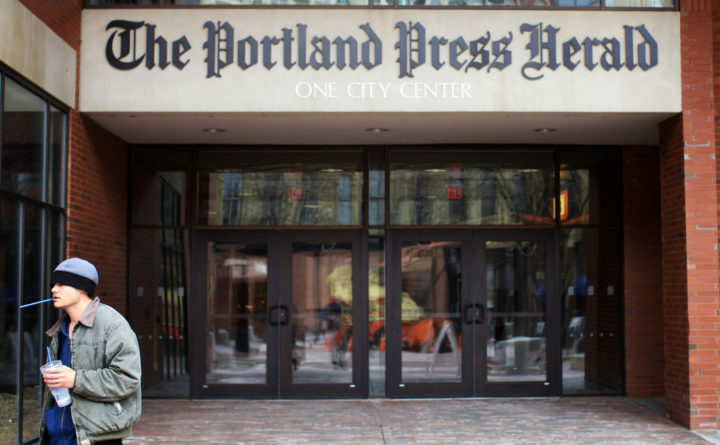 The Portland Press Herald and Maine Today Media offices in One City Center in Portland as seen in April 2015. The newspaper has since moved most of its staff to South Portland. MaineToday Media owner Reade Brower said Friday he is expanding his newspaper group — which dominates the news landscape in Maine — by purchasing two daily newspapers and related weekly publications. His company, RFB Enterprises, will buy The Times Record of Brunswick, the Journal Tribune of Biddeford and the Mainely Media weekly publications from Pennsylvania-based Sample News Group. Terms of the sale, which is scheduled to close April 1, were not disclosed. With the sale, Brower’s companies will own all but one of the daily newspapers in Maine. The Bangor Daily News is owned by longtime publisher Richard Warren. MaineToday Media publishes the Portland Press Herald and Maine Sunday Telegram, as well as the Kennebec Journal in Augusta and Morning Sentinel in Waterville. Brower also bought the Lewiston Sun Journal and its affiliated papers, such as The Forecaster weekly newspapers, for an undisclosed price last July. Dipayan Ghosh, a fellow at Harvard University’s Shorenstein Center on Media, Politics and Public Policy, told the Bangor Daily News Friday there are pros and cons to such media consolidation. Brower’s companies’ presses have been printing the Sample publications in Brunswick and South Portland “for years,” he said in a statement published Friday by the Journal Tribune. The sale of the Maine newspapers to Brower’s company represents something of an indirect swap, as Sample is buying newspapers in Vermont from another company partly headed by Brower. In a separate deal in which Brower is involved, Sample News Group will buy two Vermont newspapers from Vermont Community Media, according to the Eagle Times. Brower is a partner in Vermont Community Media with businessman Chip Harris of New Hampshire. The Eagle Times reported Sample News will buy Vermont’s Rutland Herald and Times Argus newspapers, along with two weekly newspapers and associated websites operated by Vermont Community Media. That sale, also for an undisclosed price, is expected to close in late March. Terms of the sale were not released. Follow the Bangor Daily News business page on Twitter @BDNbiz.